Showing results for tags ' contest'. Female Member ATV Photo Contest VOTE! 2013 QUADCRAZY Most Comments Contest! The QUADCRAZY MOST COMMENTS Contest is back! We had such success running this contest in 2012, with the help of our contest sponsors below, we're able to do it again in 2013! Now from June through August, the top member with the most comments/posts each month, will win the Grand Prize of one of every prize below! (Prizes can be added by sponsors anytime) You must have at least 30 comments for that month, to win. Please click on the sponsors below for more info on the prizes. One winner each month with the most comments will get: QUADBOSS 20 ft Recovery Rope by Bubba Rope HMF Pipe 50% off Gift Certificate $25 Chaparral Motorsports Gift Card $25 Rocky Mountain ATV MC Gift Card GearUp2Go $25 Gift Card $25 Motorcycle Superstore Gift Card 4 Wheel Parts $25 Gift Card We are counting comments for the following areas only: 1. Member Profile Page Comments/Guestbook Sections 2. Picture Comments under our Picture Section 3. Video Comments under our Video Section 4. Blog Comments under our Blog Section 5. Forum Posts in our Forum Section 6. Music Comments in our Music Section Now that's a nice prize pack! Please visit the contest page for more info and tracking. Have fun and start socializing!!! March 2013 ATV Fix Up Contest! Contest Rules: Submit your write-up in a post within this thread. Your write-up should include: An answer to the statement, "Tell us how you'd use your gift card to fix up your quad". You can include photos, videos, specs, and anyting creative that will make your entry stand out. It's up to you. * You may not submit photos/videos/content that you do not have ownership of or permission to use. Any violation of these terms will result in disqualification. Last day to enter this contest is March 31st. The winner will be chosen by QUADCRAZY and BikeBandit. Check out some of these great promotions going on at BikeBandit.com! February 2013 ATV Photo Contest Vote! 2012 Holiday ATV Photo Contest! Halloween 2012 ATV Photo Contest! Halloween 2012 ATV Photo Contest - Entries Below! Please Vote For The Best Photo. turk740 cptnobvis wylde1 Ajmboy mxquadmom swampcat07 Contest Rules and Info Below: Theme: "Scariest ATV" Photo. Dress up your ATV for Halloween! * Does not have to be your machine, but you must have ownership to the photo, consent from the owner of the machine to photograph it, and permission to use it on www.quadcrazy.com. Prize: 4Wheel ATV Action - 1 Year Subscription Rules: Submit your "Scariest ATV" Photo with your ATV, 3 wheeler, or UTV by entering it with a post, into this thread. (If you are not familiar with how to do this, visit the Learning Center) One photo per member allowed, so make sure it's a winner. You may submit photos that have not won past contests. Photos can be of yourself or taken by you. You may not submit photos that you do not have ownership of or permission to use. Any violation of these terms will result in disqualification. Last day to enter a photo is October 31st, Halloween. Voting will start on November 1st and end on November 14th, giving everyone 2 weeks to cast their vote. Good Luck! 2012 QUADCRAZY Most Comments Contest! The QUADCRAZY MOST COMMENTS Contest is back! We had such success running this contest in 2011, with the help of our contest sponsors below, we're able to do it again in 2012! Now from June through August, the top member with the most comments/posts each month, will win the Grand Prize of one of every prize below! You must have at least 30 comments for that month, to win. Please click on the sponsors below for more info on the prizes. One winner each month with the most comments will get: 2" Swivel Tie Downs $44.95 MSRP HMF Pipe 50% off Gift Certificate RZR Mask $29.95 MSRP $25 Rocky Mountain ATV MC Gift Card $25 Superstore Gift Card $25 4 Wheel Parts Gift Card GearUp2Go $25 Gift Card $25 OHS Motorsports Gift Card $25 Tiger Tail Gift Card MOTO1 Wash Pack $22.50 MSRP ATVAIR $19.95 MSRP We are counting comments for the following areas only: 1. Member Profile Page Comments/Guestbook Sections 2. Picture Comments under our Picture Section 3. Video Comments under our Video Section 4. Blog Comments under our Blog Section 5. Forum Posts in our Forum Section 6. Music Comments in our Music Section Now that's a nice prize pack! Please visit the contest page for more info and tracking. Have fun and start socializing!!! May 2012 ATV Photo Contest Vote! April 2012 ATV Photo Contest - Vote! March 2012 ATV Photo Contest Vote! March 2012 ATV Photo Contest Read our ATV Air write up here Theme: "Best Modification" with your ATV, 3 wheeler, or UTV. (Modification can be any aftermarket add-on, a fabrication, or upgrade to your machine) * Does not have to be your machine, but you must have ownership to the photo, consent from the owner of the machine to photograph it, and permission to use it on www.quadcrazy.com. Prize: ATVAIR - for four wheelers, three wheelers and smaller ATV's. Click Here to Buy One Now at www.atvair.com Rules: Submit your "Best Modification" with your ATV, 3 wheeler, or UTV by entering it with a post, into this thread. (If you are not familiar with how to do this, visit the Learning Center) One photo per member allowed, so make sure it's a winner. You may submit photos that have not won past contests. Photos can be of yourself or taken by you. You may not submit photos that you do not have ownership of or permission to use. Any violation of these terms will result in disqualification. Last day to enter a photo is March 27th. Voting will take place for the last 4 days of March to determine the winner. Voting will end March 31st and the winner will be announced! Good Luck! February 2012 ATV Photo Contest - Vote! January 2012 ATV Photo Contest Vote! January 2012 ATV Photo Contest! January 2012 ATV Photo Contest Theme: "Winter ATV Photo" with your ATV, 3 wheeler, or UTV. * Does not have to be your machine, but you must have ownership to the photo, consent from the owner of the machine to photograph it, and permission to use it on www.quadcrazy.com. Prize: QuadBoss XT ATV Hand Mitts Check out the press release here! Rules: Submit your "Winter ATV Photo" with your ATV, 3 wheeler, or UTV by entering it with a post, into this thread. (If you are not familiar with how to do this, visit the Learning Center) One photo per member allowed, so make sure it's a winner. You may submit photos that have not won past contests. Photos can be of yourself or taken by you. You may not submit photos that you do not have ownership of or permission to use. Any violation of these terms will result in disqualification. Last day to enter a photo is January 27th. Voting will take place for the last 4 days of January to determine the winner. Voting will end January 31st and the winner will be announced! Good Luck! Round 2: QUADCRAZY Most Comments Contest! The QUADCRAZY MOST COMMENTS Contest is back! We had such a success running this contest over the summer, we decided to do it again! Now from October through December, the member with the most comments/posts each month, will win one of every prize below! New prizes may also be added during the contest period by supporting sponsors! You must have at least 30 comments for that month, to win. Please click on the sponsors below for more info on the prizes. $25 Rocky Mountain ATV MC Gift Card $25 Motorcycle Superstore Gift Card 4 Wheel Parts $25 Gift Card 1 Gallon QuadBoss Tire Sealant $53.95 MSRP 8" Die-Cut Sticker GearUp2Go $25 Gift Card Cycle Gear $35 Gift Card NEW! * More Sponsors May Be Added During The Contest! By the end of each month, everyone on the 'MOST COMMENTS" lists here, will receive 5 QUADCRAZY Stickers! It's easy to win, just write a comment to a fellow member on their page, picture, video, or blog. There are over 5,900 forum threads, 5,800 members, 4300 pictures, and 400 videos alone, that you can drop a comment on to win! Good Luck! * Comments that are not original and considered spam will be removed, bringing your total down. Winning comments will be reviewed and re-calculated if needed, so post wisely! We are counting comments for the following areas only: 1. Member Profile Page Comments/Guestbook Sections 2. Picture Comments under our Picture Section 3. Video Comments under our Video Section 4. Blog Comments under our Blog Section 5. Forum Posts in our Forum Section 6. Music Comments in our Music Section You can can post your contest questions in this thread. We will update this thread with contest news. Good Luck! September 2011 ATV Photo Contest Vote! September 2011 ATV Photo Contest! September 2011 ATV Photo Contest Theme: "Sitting & Ready To Ride" on your ATV, 3 wheeler, or UTV. * This should be a photo of you sitting on your quad, and about to go riding. * Does not have to be your machine, but you must have ownership to the photo, consent from the owner of the machine to photograph it, and permission to use it on www.quadcrazy.com. Prize: 8" Die-Cut QUADCRAZY Sticker & QUADCRAZY Hat with embroidered logo! 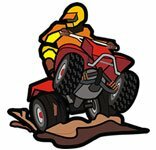 Rules: Submit your "Sitting & Ready To Ride" with your ATV, 3 wheeler, or UTV by entering it with a post, into this thread. (If you are not familiar with how to do this, visit the Learning Center) One photo per member allowed, so make sure it's a winner. You may submit photos that have not won past contests. Photos can be of yourself or taken by you. You may not submit photos that you do not have ownership of or permission to use. Any violation of these terms will result in disqualification. NOTE: You MUST have a minimum post count of 10 to enter into the contest! We would like to see participation in our forums from all members who enter the contest. Last day to enter a photo is September 26th. Voting will take place for the last 4 days of September to determine the winner. Voting will end September 30th and the winner will be announced! Good Luck! From June through August, the member with the most comments posted each month, will win one of every prize below! New prizes may also be added during the contest period by supporting sponsors! You must have at least 30 comments for that month, to win. Please click on the sponsors below for more info on the prizes. ATV World Magazine Subscription $25 Motorcycle Superstore Gift Card 4 Wheel Parts $25 Gift Card 1 Gallon QuadBoss Tire Sealant $53.95 MSRP RZR Mask $29.95 MSRP GearUp2Go $25 Gift Card - NEW For JULY & AUGUST! * More Sponsors May Be Added During The Contest! By the end of each month, everyone on the 'MOST COMMENTS" lists here, will receive 5 QUADCRAZY Stickers! It's easy to win, just write a comment to a fellow member on their page, picture, video, or blog. There are over 5,000 members, 4000 pictures, and 400 videos alone, that you can drop a comment on to win! Good Luck! * Comments that are not original and considered spam will be removed, bringing your total down. Winning comments will be reviewed and re-calculated if needed, so post wisely! We are counting comments for the following areas only: 1. Member Profile Page Comments/Guestbook Sections 2. Picture Comments under our Picture Section 3. Video Comments under our Video Section 4. Blog Comments under our Blog Section You can can post your contest questions in this thread. We will update this thread with contest news. Good Luck! May 2011 ATV Photo Contest Vote! March 2011 ATV Photo Contest! March 2011 ATV Photo Contest Theme: "Best Front Wheels Up" with your ATV, 3 wheeler, or UTV. * This can be a wheelie photo, front tires elevated or on something making them higher, or anything you can imagine that makes your front tires higher in the photo than your rear tires. * Does not have to be your machine, but you must have ownership to the photo, consent from the owner of the machine to photograph it, and permission to use it on www.quadcrazy.com. Prize: Rocky Mountain ATV $25 Gift Card Rules: Submit your "Best Front Wheels Up" with your ATV, 3 wheeler, or UTV by entering it with a post, into this thread. (If you are not familiar with how to do this, visit the Learning Center) One photo per member allowed, so make sure it's a winner. You may submit photos that have not won past contests. Photos can be of yourself or taken by you. You may not submit photos that you do not have ownership of or permission to use. Any violation of these terms will result in disqualification. NOTE: You MUST have a minimum post count of 10 to enter into the contest! We would like to see participation in our forums from all members who enter the contest. Last day to enter a photo is March 27th. Voting will take place for the last 4 days of March to determine the winner. Voting will end March 31st and the winner will be announced! Good Luck! February 2011 ATV Photo Contest Vote! February 2011 ATV Photo Contest! February 2011 ATV Photo Contest Theme: "Best Race Photo" with your ATV, 3 wheeler, or UTV. * Does not have to be your machine, but you must have ownership to the photo, consent from the owner of the machine to photograph it, and permission to use it on www.quadcrazy.com. Prize: Combo 1 year Subscriptions to ATV Action & Dirt Wheels (both titles) Rules: Submit your "Best Race Photo" with your ATV, 3 wheeler, or UTV by entering it with a post, into this thread. (If you are not familiar with how to do this, visit the Learning Center) One photo per member allowed, so make sure it's a winner. You may submit photos that have not won past contests. Photos can be of yourself or taken by you. You may not submit photos that you do not have ownership of or permission to use. Any violation of these terms will result in disqualification. NOTE: You MUST have a minimum post count of 10 to enter into the contest! We would like to see participation in our forums from all members who enter the contest. Last day to enter a photo is February 24th. Voting will take place for the last 4 days of February to determine the winner. Voting will end February 28th and the winner will be announced! Good Luck! January 2011 ATV Photo Contest Vote! January 2011 ATV Photo Contest! January 2011 ATV Photo Contest Theme: "Best Winter Photo with your ATV, 3 wheeler, or UTV." * Does not have to be your machine, but you must have ownership to the photo, consent from the owner of the machine to photograph it, and permission to use it on www.quadcrazy.com. Prize: ATV & SXS Illustrated & UTVlifeSTYLE (1 year Subscriptions) Rules: Submit your "Best Winter Photo with your ATV, 3 wheeler, or UTV" by entering it with a post, into this thread. (If you are not familiar with how to do this, visit the Learning Center) One photo per member allowed, so make sure it's a winner. You may submit photos that have not won past contests. Photos can be of yourself or taken by you. You may not submit photos that you do not have ownership of or permission to use. Any violation of these terms will result in disqualification. NOTE: You MUST have a minimum post count of 10 to enter into the contest! We would like to see participation in our forums from all members who enter the contest. Last day to enter a photo is January 27th. Voting will take place for the last 4 days of January to determine the winner. Voting will end January 31st and the winner will be announced! Good Luck!